What do the estates of film stars Vincent Price and Glenn Ford have in common? And what do each of these estates have in common with valuables owned by Laugh-In’s Arte Johnson, Partridge Family Mom Shirley Jones, and Room 222 star Karen Valentine, along with many other Hollywood stars? The answer: all possess classic wood sculptures created by world-renowned artist, the late Arnold Mikelson, and each piece tells a story as exotic and as complex as Mikelson’s too-short life. The highlights of Mikelson’s career include such diverse accomplishments as having been Chief Designer for Royal Crown Derby Porcelain of England, a company founded in 1750, but revitalized under his artistic leadership; a move to Canada at the invitation of Senator Donald Cameron, one of the patrons of the world famous Banff Centre, known in the 1950s as The Banff School of Fine Arts; and the creation of the Mind and Matter Gallery in South Surrey/White Rock, B.C., a facility that still displays much of his original work decades after his death. But to appreciate these highs, to understand something about the man hailed as one of the finest artists of his time, one must travel back in time to humble beginnings in Mikelson’s native Latvia. Arnold Mikelson was born the son of a cabinetmaker in the small river town of Rauna, Latvia in 1922. Latvia is a country of ancient castles and ancient history, having been bandied about from faction to faction since before the Crusades in A.D. 1200. It was in the years between two great wars that the youngster, at age four, was noticed by a visiting aunt to be carving a piece of wood at the foot of his father’s workbench. The aunt pointed this out to the parents, observing that this was truly a gifted child, young Arnold’s art education began almost immediately, and up to the age of 16 he studied and worked at various artistic crafts. Although his formal education was that of a mechanical engineer, his passion was art in many forms. 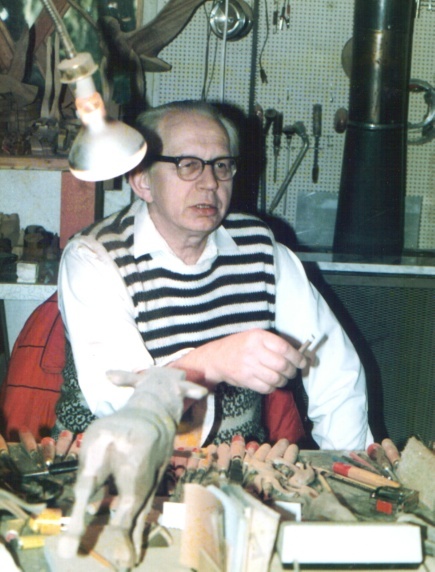 He was a painter and a sculptor, and by the age of 17, with World War II looming over eastern Europe, Arnold Mikelson was awarded a Gold Medal in the Latvian seaport capital of Riga for his contribution to the arts there. For reasons no one quite understands, Mikelson gave up painting at the age of 28, a pursuit at which he excelled, and settled on sculpture almost exclusively. He loved to sculpt in any and every medium, and it’s that work that lives on in museums, private collections, and in galleries around the world. In 1940 with war breaking out across Europe and spreading like a cancer, the Russians invaded Latvia, accusing its leaders, and those of neighboring Estonia, of setting up a secret anti-Soviet alliance. Arnold Mikelson, along with thousands of his countrymen, fled to Germany. During seven years in that war-torn country, Mikelson managed some 40 employees, artisans who made wooden hope chests, jewelry boxes, wooden plates, and chandeliers. The workers made the items with care and consideration, while Arnold created exquisite carvings to complete what began as simple wood items, and ended as works of art. To this day there are many churches throughout Germany that contain beautiful carved chandeliers crafted by the talented hands of Arnold Mikelson. In 1947 with the war over and life in Europe beginning a return to normal, the general population was again inclined towards artistic pursuits and the finer things in life. Rationing was finished and life was becoming more than just a state of survival, and with that as a backdrop, Arnold Mikelson entered England as an immigrant and quickly came to the attention of Mr. H.T. Robinson, head of the 200 year-old Royal Crown Derby Porcelain of England. It was at Royal Crown, a company steeped in history but struggling to regain its past greatness, that Mikelson began working at the creation of three-dimensional sculptures. Mikelson was made the company’s Chief Designer, and reveled in the challenge of working in a new medium. His design leadership, including the famous "Chelsea Birds" now a world favorite, helped revitalize and rebuild Royal Crown to some of its former grandeur. 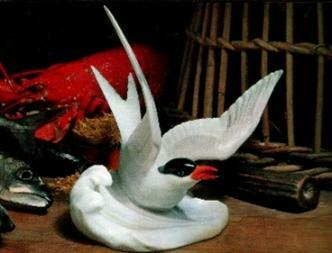 To this day his work, consisting largely of bird sculptures, remains on display in the Royal Crown Derby Museum in England. The "Chelsea Birds", made famous in 18th Century England, can also be seen in Mikelson’s Mind and Matter Gallery in Canada. On a 1954 visit overseas, Canadian Senator Donald Cameron, appointed to government after a significant career in public education with the University of Alberta, encountered Arnold Mikelson’s work at an art exhibition in England. Cameron, among his many significant achievements, had been head of the Banff School of Fine Arts in the 1930s, and maintained a leadership connection with that facility over the years, acting as its head during his time as a Senator, and keeping that position until 1969. The Banff School was world famous even in 1954, and Cameron didn’t hesitate when he approached Mikelson and offered him a management and teaching position in the facility that sits part way up Tunnel Mountain in Banff National Park. Arnold Mikelson accepted Senator Cameron’s offer and immigrated to Canada, never having laid eyes on the country before. But when he traveled to Banff and saw the School, the finest in Canada with an international reputation, Mikelson turned down the opportunity, as the Banff facility was, by European standards tiny and insignificant. Mikelson had no way of knowing at that time that this was the very best that the comparatively new country of Canada had to offer, and he came, over time, to regret the decision he had made when he walked away from Senator Cameron’s offer. Unlike Europe, opportunities in the arts in Canada were few and far between, and even a talented, world-class sculptor has to eat. Arnold went to work as an architectural draftsman, thanks to his early training. He excelled in that profession just as he had excelled in his design and execution of his superb carvings and sculptures and developed the reputation of being one of the finest at his job in Alberta, having designed many schools, hospitals, and residential buildings throughout that province and British Columbia. After 11 years on the Prairies, Arnold decided to leave Alberta for the gentle west coast mists and showers of British Columbia, and in 1964 settled in the Lower Mainland of B.C.. Shortly thereafter, returning to his first love, he designed and built his own gallery, The Mind and Matter, his thinking following the premise that "the mind creates it … and the matter, which is the hand, illustrates it." Getting the gallery established required two main ingredients – time and talent, and Mikelson had both. He worked 12 to 16 hours a day virtually every day creating, experimenting, and building. He worked in stone, in metal, and created jewelry in precious metals such as silver and gold. He surrounded himself with exotic woods for conversion into works of art, including satin walnut, Tennessee aromatic cedar, and mahogany, all kiln-dried, all destined for greatness. In 1971 the second-largest art college in the United States, the Amy Ryan Fine Arts Center in Abilene, Texas commissioned Arnold Mikelson to create three sculptures for its Fine Arts Center. "Roadrunner", a roadrunner attacking a rattlesnake was one of the pieces, depicting the state bird of New Mexico. The "Mockingbirds", the state bird of Texas, along with "Inspiration", a seven foot angel completed the set. Today these works are on permanent display at the Amy Graves Ryan Center of Fine Arts in Abilene. Less than a dozen years after arriving in British Columbia, and some 22 years after first setting foot on Canadian soil, Arnold Mikelson was again reaching for the top as an artist. Exhibitions featuring his work were held at the British Columbia Provincial Museum, and at locations all across Canada. 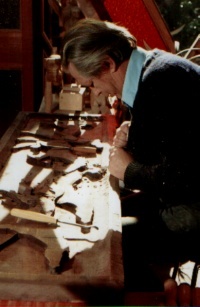 In 1976 on the grounds of the Canadian National Exhibition in Toronto he was invited to participate by the International Carvers Association with 1,500 entrants from all over the world. Mikelson’s work won in 11 out of 15 categories, he was given the Gold and Silver Medals for his accomplishment, and he was invited back the next year as a judge for the International Carvers Exhibition. A year later England called again, this time in an appeal to American woodcarvers to help raise funds for the maintenance of Southwell Minster, a Cathedral in the heart of rural Nottinghamshire, near Sherwood forest. In the early 1970's the Church Commissioners passed on the responsibility of maintaining the building to the Cathedral itself; lacking the funds needed to do so fundraising began. Organizers felt that demonstrating wood carving and exhibiting fine sculptures on the grounds of the cathedral, and at nearby castles, would be a great fundraising idea. 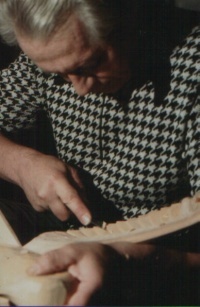 Mr. Mikelson was one of two Canadians to join the American carvers. The American Woodcarvers Association helped with the organization and the sum of 350,000 Pounds, nearly a million dollars Canadian, was raised. As the years rolled by, Arnold Mikelson’s recognition and reputation continued to rise with the strength and assertiveness of the bird sculptures that he created with such apparent ease. But success is never easy and he routinely worked 12 to 15 hours a day, even after his gallery was well-established and the accolades came in on a daily basis. He maintained that a person only needs four hours of sleep each day, and used the other hours in pursuit of his art. Mikelson’s work has been commissioned by such diverse entities as forestry giant Macmillan Bloedel (now Weyerhaeuser Canada), the Province of British Columbia, and the City of Surrey. In addition to receiving recognition, Arnold Mikelson was also big on giving it. He taught at several local schools, sharing his gift and his love of art with all who showed interest, and he was especially concerned with helping children develop appreciation for art. School children visiting the Mind and Matter Gallery would hear a talk from Mary Mikelson, Arnold’s loving wife, and he would demonstrate carving to the students, showing them, explaining, and allowing them to touch, feel, and try their own small hands at carving. 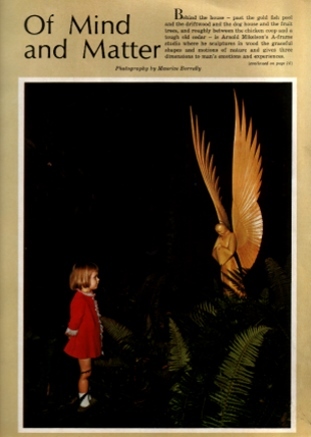 Mary continues to this day, years after Arnold’s untimely death, with the parade of wide-eyed children through the Gallery’s explosion of beauty and finery, a perfect tribute to Arnold’s memory. Known for his generosity and for the freedom with which he gave his time, Arnold Mikelson became well-known in media, the subject of stories and articles in such diverse publications as Fine Woodworking Magazine, Beautiful British Columbia Magazine, and Westworld, as well as such newspapers as the Toronto Star, the Globe and Mail, and the Vancouver Sun. CBC Television and CTV both featured him at various times, and upon his death in 1984, the newspaper of his adopted hometown, White Rock’s Peace Arch News, wrote, "… a giant in the art world of White Rock, and around the globe is gone. Sculpture, craftsman, and a man revered around the world …"
Today the Mind and Matter Gallery on the grounds of Arnold Mikelsons home remains a Mecca for art aficionados from all over the world. His widow Mary continues to maintain it, and to exhibit his work and that of artists from all over the globe, in exactly the way that Arnold would have wanted. The Mind and Matter gallery offers unique items from over 30 artists on rotating monthly exhibits. The gallery is open daily from 12:00 to 6:00pm. Copyright 2012 Mind and Matter Gallery. All rights reserved.